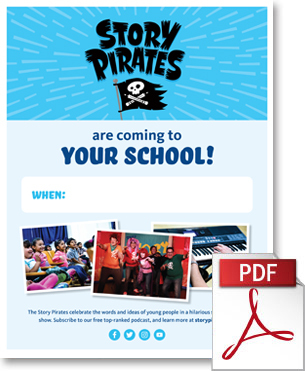 The Story Pirates will be coming to your school soon. We hope the following resources will be helpful as you prepare for the visit. We also offer professional development for educators. Want to check out more about Story Pirates? You might also be interested in the Story Pirates Podcast, our new book Stuck in the Stone Age, our Cast Out Common Words series or our YouTube Channel!